Rubbing to edges and corners bumped. Spine and covers creased. Spine torn. The Animal Sanctuary stated almost by accident - just a collection of strays and injured animals brought in by neighbours. But soon it's a major part of the farm business, bringing in paying visitors, and taking a lot of time to run. Martin doesn't want anything to do with it. He's no longer scared of animals, but still feels an outsider with his step-family, often walking with his dog, Blue, to be alone. 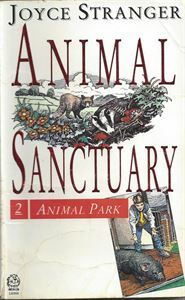 Gradually though, the appeal of the animals captivates him, filling him with ideas for improving the sanctuary, and forcing him to acknowledge his new life.